As usual, the Ancient Greeks feature early in the story. As usual, they did a brilliant job of spotting a problem – in this case, how to handle formal categorisation about the world – and then came up with a brilliantly plausible answer that was almost right, and that messed up Western thought for centuries afterwards. We don’t need to get into the details of where classical logic missed some major alternatives. The bottom line is that classical logic provided an impressive set of concepts and technical terms to anyone who wanted to split the world into simplistic, black and white, either/or, binary categories. It also implicitly reinforced the idea that splitting the world into just two categories was a sign of intellectual rigour, and of ability to cut to the heart of the matter. An example from education is the common view that there’s a dichotomy between learning and play, like this. In this view, you can either have play and fun, or you can have learning, but you can’t have both at the same time. 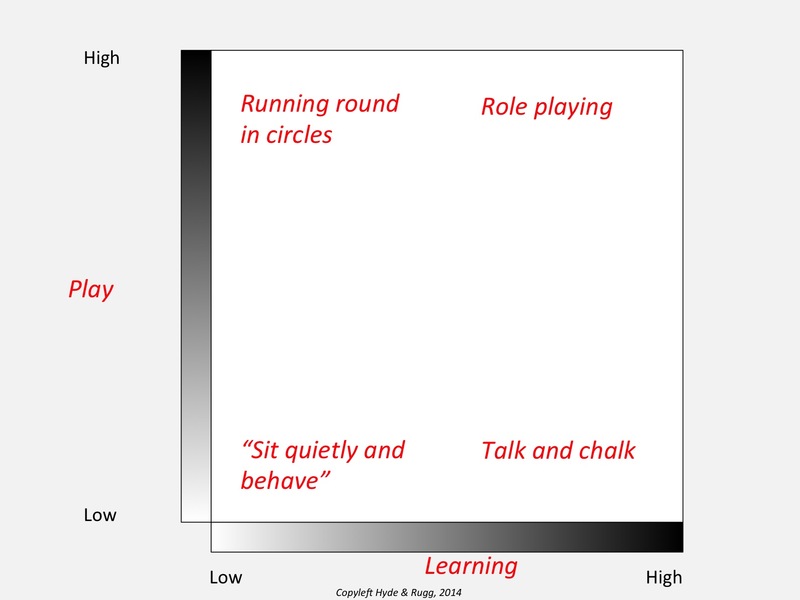 There’s a similar but slightly less simplistic view that learning and play form a continuum, where more time spent in play means less spent in learning, and vice versa. However, there are also other ways of viewing the relationship between learning and play. Here’s one. 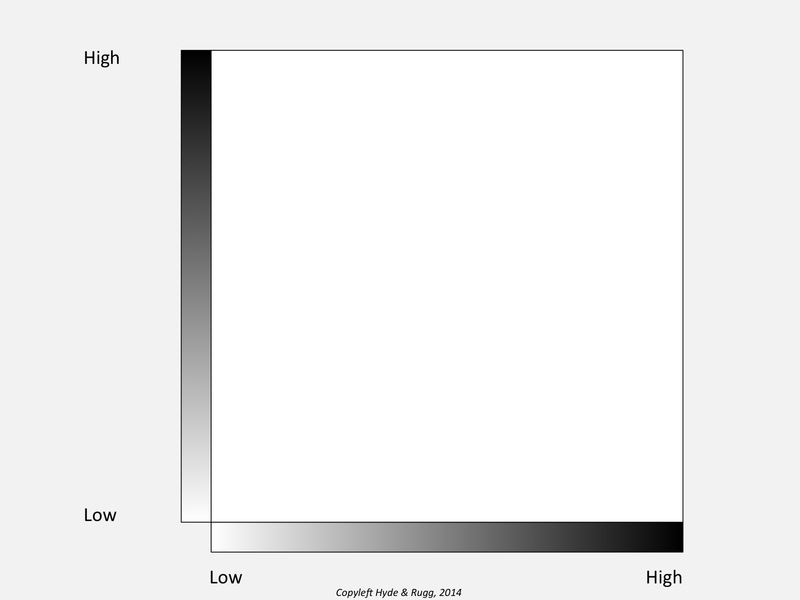 In the diagram above, activities are plotted on two dimensions. The amount of play involved in an activity is shown on the vertical dimension; the amount of learning involved is shown on the horizontal dimension. Each activity can therefore be anywhere between low and high both on the amount of play and on the amount of learning associated with it. In this representation, talk and chalk is very much about play, with very little play involved. Conversely, running round in circles is largely about play, with very little play involved. For these two examples, more of one dimension is associated with less of the other. Other activities, however, form a different pattern. Some activities involve hardly any play and also involve hardly any play. A classic example is children having to sit still and be quiet on the school bus on a field trip. Conversely, some activities involve both a lot of play and a lot of learning, such as role play. This has obvious parallels with the relationship between other dimensions, such as the relationship between the emphasis on theory and practical application included in a course. Again, these are often viewed as mutually exclusive, or as a trade-off. Again, though, they can be viewed as being two separate dimensions. For example, computing is a broader discipline than many people realise, and spans a range of topics that include abstract computational concepts (the academic theory label in the diagram) and hands-on programming (the practical classes label in the diagram). It would also be possible to teach some topics, such as the history of computing, by rote learning, which includes very little theory or practice. What students usually find most rewarding is when they learn the academic theory, and are then able to apply it to a real problem, so they can learn the practical advantages from that theory at first hand (applying theory to practice). There are a lot of other hotly debated topics in education theory where this sort of re-viewing could bring productive new insights. Examples include traditional versus progressive teaching; good versus bad behaviour; and school versus no education. If you’d like to try your own mappings along these lines, you might find the blank diagram below useful. It can be downloaded as an image, and then inserted into a PowerPoint slide, where you can then add your own captions etc. We’ll be blogging again soon about other educational topics. This entry was posted in categorisation, education theory, visualisation and tagged dichotomies, false dichotomies, learning and play, theory and practice by hydeandrugg. Bookmark the permalink.